There is something very reassuring about Grace Road for Northants fans. It’s not that it’s a great place to watch cricket, or the enjoyment of our welcome victory this week, but we know if there is going to be a second midlands team in any new Twenty20 franchise, it won’t be based at a floodlight-free Leicester. The ground looks like it’s made of Lego with its bland blocks of red, white and yellow seats and no natural curves in sight, and the ugly oblong pavilion looks like its from a World War Two airfield. Knowing how commercial Lego is today, you can probably buy the Lego Leicestershire CCC Ground set. Sadly, the two east midlands clubs are united on something this season - championship cricket is not as important as Twenty20 these cash strapped days. Going into this week’s game, Leicestershire had won just four games in four years, and Northants were coming off that winless season. This really was a battle for survival in so many ways, but happily the Northants players do respect the first-class game and delivered that impressive 92-run victory. 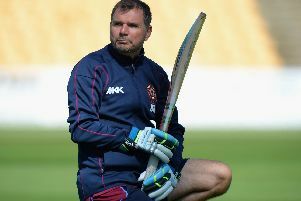 New Leicester captain Mark Cosgrove wisely put Northants in on a chilly Sunday morning on an emerald green pitch as David Ripley sent out an unchanged batting-heavy 11 to not lose. There was still no spinner and just four bowlers. This lack of bowling proved cruel for the first game on a lump of concrete at Wantage Road, a pitch that went on to produce 2,000 runs in back-to-back matches. Leicestershire suffered something similar in their first game, and so both sides’ bowlers will have been pleased looking at the Grace Road grass. If you are going to play on a flat pitch with no spinner, I would say you need five bowlers, and I reckon Steven Crook should have played here, and against Gloucestershire. He has proved himself in the IIs since. Seeing James Middlebrook get a short term deal at county champions Yorkshire to cover for Rashid as their number one spinner sums up how crazy the decision was to dump him in the winter. Decisions like that one and the stated apathy towards the four-day stuff with a small squad has really upset fans, and some have cancelled memberships. Northants being dismissed just after tea for 251 was a bit disappointing but an early season-seamer type score all the same, only Rob Newton really getting a score of note with his signature lusty square cuts for 71. Richard Levi opening was worth a try, but I can’t see that lasting, and surely it’s time for Alex Wakely to try and bat number one instead? The way the captain plays at the moment is not to get out rather than score confident runs, and that’s what openers essentially do. I think he will be great striding out to start the innings and so doesn’t have to worry about getting done by a good ball anymore, what openers also suffer. I’m not convinced Levi wants to open. Leicestershire, sniffing their first win for 26 months, set about opening with gusto. Although rain was forecast, it didn’t show and a decent sprinkling of Northants fans there to enjoy Leicester blow a promising innings to tumble from 139 for one to 305 all out, and this was where the game was lost. David Willey digging out Robson for 75 was the trigger, and control was wrestled back with efficient seam bowling, topped off by Josh Cobb’s first Northants wicket against his old mates. I think most of us would have taken a 50 deficit at lunch. That gave confidence to the batsmen with Wakley starting to go through the gears with a solid 40 and Stephen Peters’ first 50 for a year, Newton (58) looking much happier in division two with his second half-century of the match. But it was yet again the David Willey show as he celebrated his expected - if a little early - England call up with another rapid hundred partnership with big Rory Kleinveldt, the John Daley of all-rounders, the most uncomplicated of cricketers I have seen at Northamptonshire, clubbing 56 off 34 balls. I have a feeling these two will be doing a lot of this entertaining batting during the season. Willey is fabulous when he tees up and the Judd Trump of tail-end county cricket, and he hit a boundary-packed 88 this time around. Coming in at eight to suit him as he only really plays one way, and so if he wants to score runs he naturally gets on with it. A second innngs total of 429 all out was a cracking effort, and that home green pitch tactic Leicestershire inserted Northants on had backfired. After surviving a tricky 12 overs before the close, although they did lose Redfern to Willey, you still felt Leicestershire could get up for the 365 on an improving wicket. But it was not to be for them on the final day as big Kleinveldt came to the party with four wickets. The South African was still learning the best lengths to bowl in England for the first game and looked more knowledgeable here. He still looks a bit pedestrian but if you hit the right areas on English pitches the wickets will come. Mohamed Azharullah (3-77) appears to be bowling a quicker delivery this year and catching guys out, and maybe bowling more overs makes him fitter. Olly Stone was accurate as ever with two for 32 off 18 overs and sealed the deal for that welcome victory, with 50 extras being second top scorer to Northants old boy Nial O’Brien’s 58. If only this same quartet had been given a green strip to bowl on in the first match against an inferior Gloucestershire pace attack. If they had, then the boys may well have been top. No more concrete slabs at the County Ground please!